Google seems to be tested two new ad styles for their AdSense ad units. One design places the enclosed arrow in a circle within the center of the ad unit and the other design uses a transparent white, with patterns through the background. Also, a WebmasterWorld thread has an AdSense publisher complaining that Google is forcing an "ugly white ads with patterned background with white-grey stripes," on his ads, despite him not selecting those ad styles in the AdSense control panel. 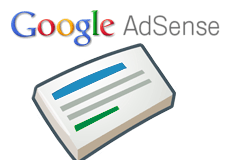 Google is frequently testing AdSense design tweaks, all with the goal of improving CTR and earnings. Forum discussion at Twitter & WebmasterWorld.